Christmas is coming! I've got some exciting offerings that would make a unique gift idea and these are in-stock now. Yoga Tune Up Massage Therapy Full Body Kit (2 DVD set featuring 11 guided routines + set of Yoga Tune Up original Therapy balls) $79.95 and Yoga Tune Up Therapy Balls Plus twin set in tote $29.95. These rubber balls are designed specifically for massage - they are grippy enabling the ball to take a hold of your skin and the underlying superficial fascia and slide and transition it over the deeper fascias and muscles beneath. They are best used against bare skin, however we are fully clothed in our Massage Workshop classes (incase you were wondering!). The softness and pliability of the rubber yields around bony prominences, nuzzling around joints and grabbing the delicate tissues surrounding them - which a foam roller or a hard ball could not do. They are also a lot more portable than most foam rollers! 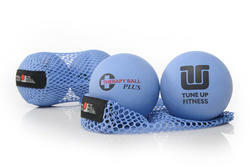 Tennis balls are a great starting point, but for serious massage students, you'll love the pliability and grippiness of these purpose designed balls. Still not sure why we massage? Watch the "Fuzz Speech" video by Gil Hedley that I have screened during some of the past Massage Workshops (warning: graphic content). I do have an upcoming Massage Workshop (read on below) and you can also combine a ball/DVD kit with a gift voucher for an upcoming Tennis Ball Massage Workshop at a discounted rate as a really unique gift that keeps on giving! Contact me or have a look at my new Online Shop http://www.flexyogaandmassage.com/shop.html for more information. The entire range of Yoga Tune Up products can be viewed on the USA website for direct shipping to Australia. 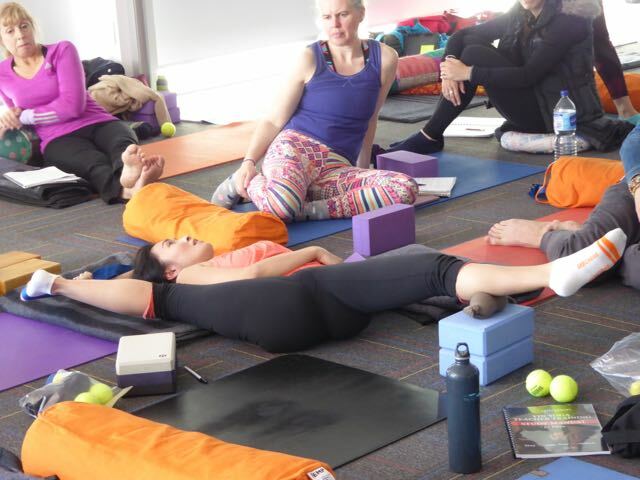 This special workshop is our end of year finale class, focusing on Yin Yoga techniques and massage ball work to release tension in the upper body (neck and shoulders, arms, hands) and upper and lower back. This is perfect for anyone carrying tension around their neck and shoulders from posture, work stress, sports and new mums. We will use tennis balls as a massage tool (optional) as well as yoga props (bolsters and blocks) to support us through this practice, which can be made as gentle as you wish. I also have a choice of different types of massage balls for you to use if you wish for a gentler (or firmer) option. 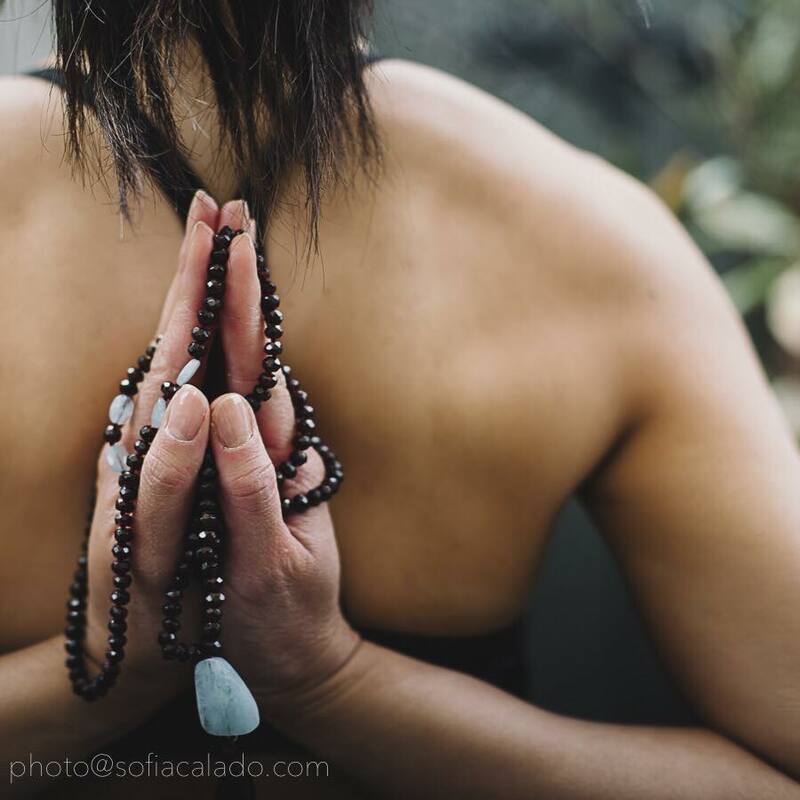 This 90 minute class will focus on long slow holds of yin yoga postures as well as the option to add balls for trigger point therapy. 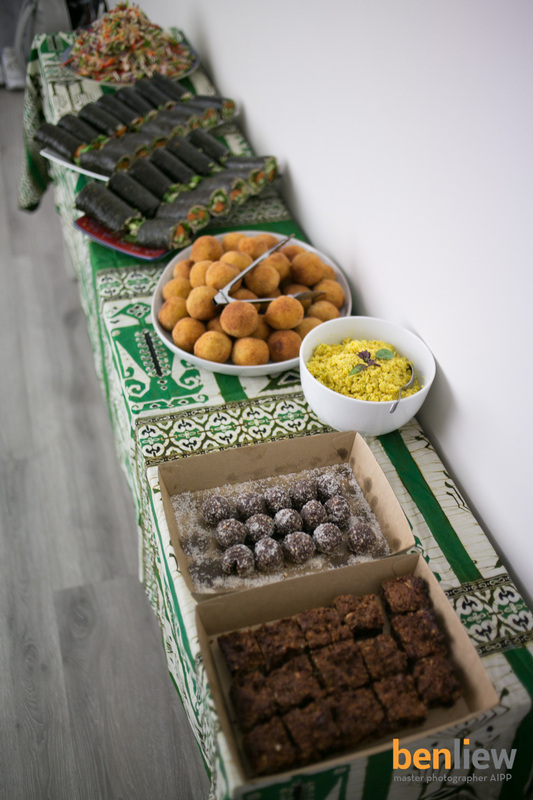 It will be lovely body tune-up to get us through the ‘silly season’, and the last class of the year with some nibbles and chai to share after class. All equipment is supplied for use during class. You can also pre-purchase your own massage ball kit to take home (2 x tennis balls, double ball and 2x mini ball for face/hands/feet) for $12, high density yoga blocks $12 or a range of Yoga Tune Up Therapy Ball and DVD products via my shop or when purchasing your Workshop ticket online. Please also check out the Facebook Event page and share with anyone you think would be interested (you get $5 discount if you book with a friend) and past Massage Workshop students are also eligible for the $5 discount. Where: Cog Creative Space, 20 Boskenna Ave, Norwood (just off Fullarton Road) 7-8:30pm Wednesday 14th December with nibbles and chai to follow. Investment: $30 per workshop, or included as part of regular yoga passes for current/new students (our Christmas break up!). Past Massage Workshop/bring a friend attendees can attend for $25. A big "thank you" to Ben for taking the images above for me after class. Follow me on Instagram or Facebook for "how to" guides for these postures. 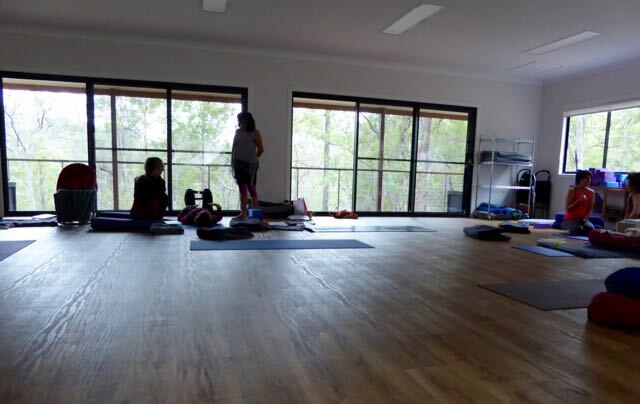 If you have been thinking about returning to yoga after a short break, the Beginner's Yoga 6 week course is underway and flowing every Monday night at Wayville 7-8:15pm until 12/12/16. Casual attendance permitted - please use my booking website or email me if you are attending. The next beginners course will start 30/1/17 and there will only be 2 intakes next year. We begin a new theme this Wednesday night at Norwood for the next 4 weeks - jump in anytime, beginners welcome. We'll be working with understanding arm balances, starting with Crow pose. I hope everyone has stayed safe in the horrible Adelaide weather that I’ve been hearing about! 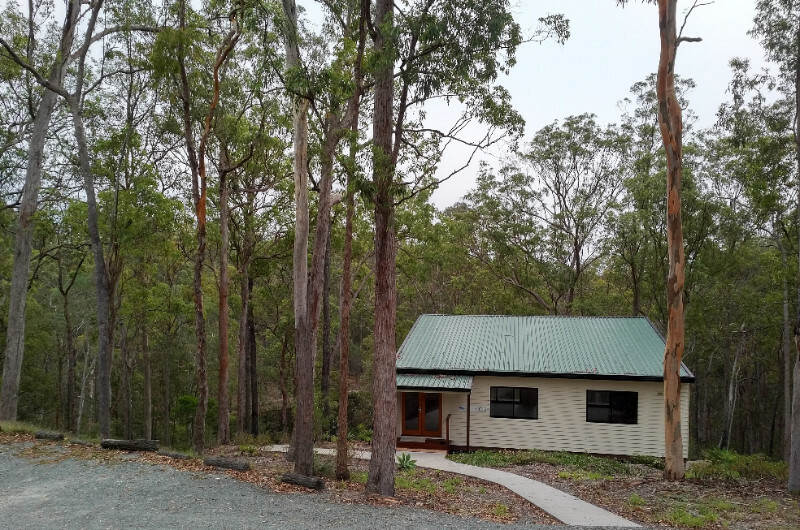 Meanwhile, I’ve been studying hard for the past 2 weeks in far north Brisbane - no phone or internet connection and the studio even has it's own long drop toilet! 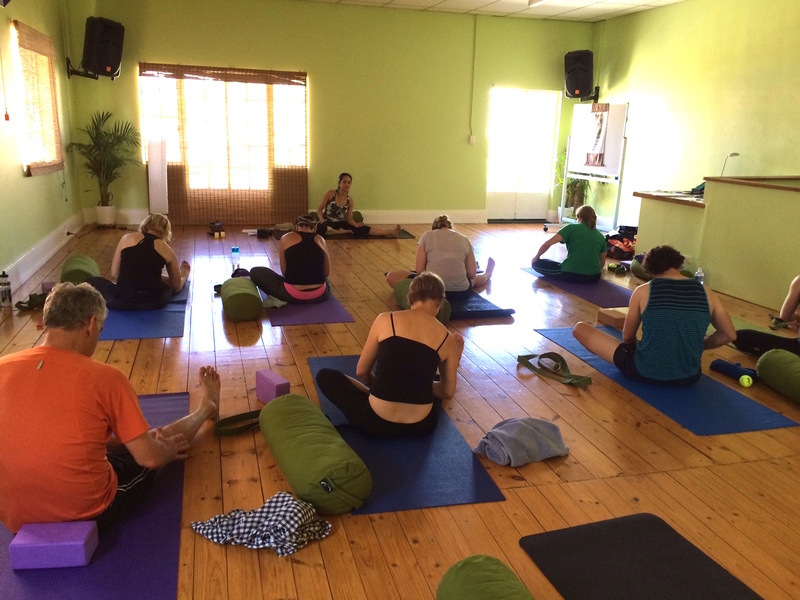 This yoga course (as part of a Level 2 500 hour training) is on the topic of Yoga Therapy, the therapeutic application of yoga to restore balance and health in an individual by working with their unique constitution. Whilst this is certainly not an area that I’ll ever be an expert in, it is invaluable to have a basic understanding on how to create a made to measure yoga sequence to assist with someone's health or recovery. The module that I have just studied focuses on shoulder, spine and hip anatomy – all the things I need work on, so I’m looking forward to adding some of these things to my own practice! I have a “unique” double scoliosis of the spine and poor posture from standing whilst typing on a computer all day so there’s a lot to work with :) . As always, I am available for private or small group yoga classes (in your own home/office) and can design a yoga sequence to best suit your needs. I hope everyone that attended the September Tennis Ball Myofascial Release workshops enjoyed themselves – I would love to hear any feedback if you did attend. I have just planned a new sequence for the next workshop scheduled for November 2nd and I tested out on my fellow yoga teacher colleagues last night – they all had a ball (sorry about the pun). 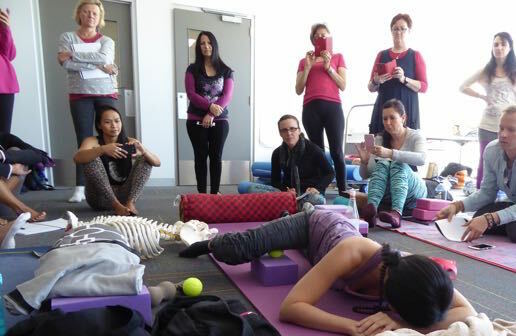 We’ve been spending a lot of time practicing yoga, but also many hours sitting on the floor in lectures – self massage is such a valuable skill in these situations! I’ll have basic notes for you, bring a pen if you want to draw pictures or make your own notes to remember what we did when you get home. The September workshops both booked out so make sure you register for the November workshop early to avoid disappointment. 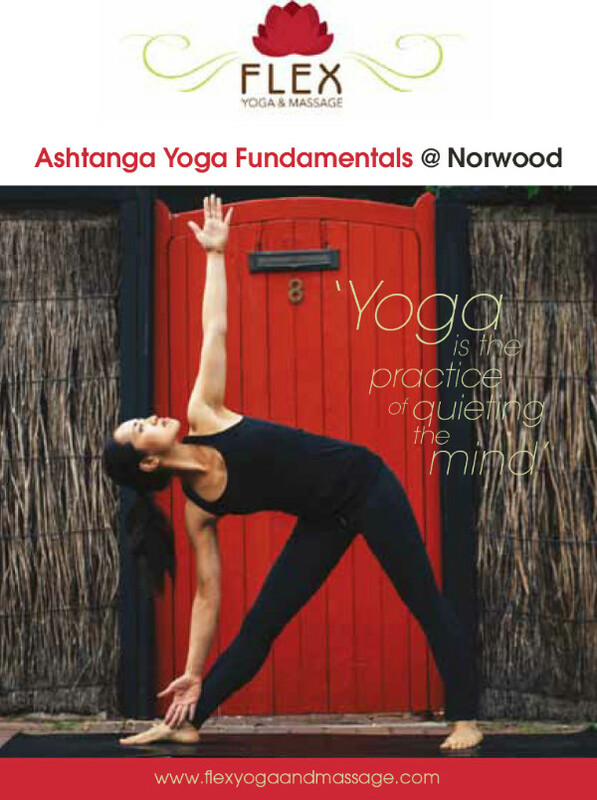 The last beginner’s yoga course for the year starts Monday 10th October. 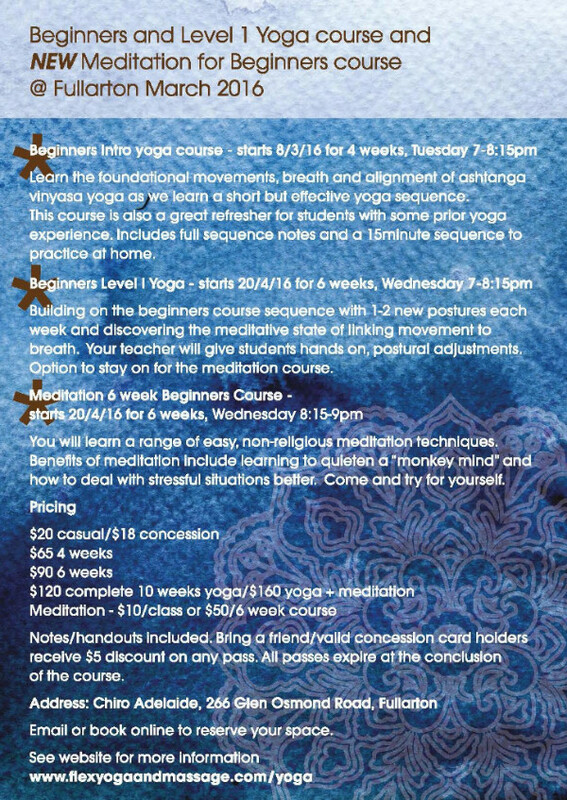 The whole 10 week course can be booked as separate modules (4 week Intro to Yoga and 6 week Yoga for Beginners). The Intro course gives you a solid foundation of posture alignment for those that have never stepped on a yoga mat before, I’ll also explain other fundamentals such as breath, bandhas and drishti over the 4 weeks. The Yoga for Beginner’s 6 week course that follows adds on 1-2 postures each week to the standing sequence learnt in the first Intro course. 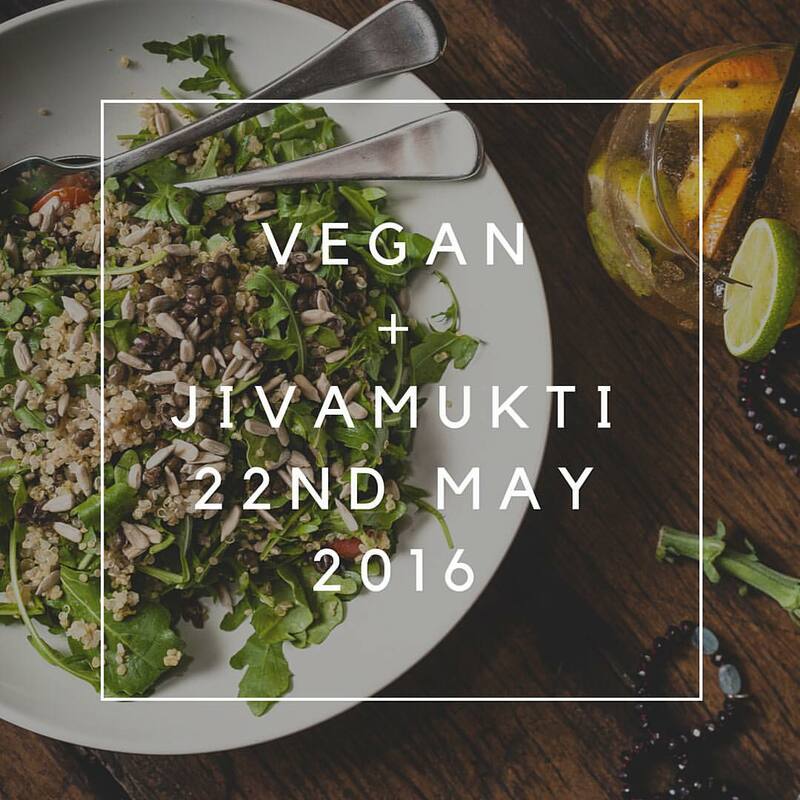 If you have any friends that you think may benefit from learning yoga, please share this event with them. My last bit of news is that the regular Wednesday night Level 1 Yoga classes recommence on 5th October (next week!). The Wednesday night classes are suitable for all levels and we focus on a set theme that changes every 6 weeks. This coming 6 week block focuses on shoulder mobility and spine (including backbends, very important as so many people have a slouched posture from sitting all day which can lead to aches and pains and disc problems) – there will be lots of options and modifications with props if required. I’ll also offer an alternative sun salute series for those with shoulder issues and can’t bear weight. Please note that week 5 (2nd November) will be the tennis ball class and all Wednesday night students are welcome to attend using their normal class passes – please pre-register so I can hold a place for you. One last bit of excitement for those of you who have read this far! There are only 12 weeks of yoga classes left for the year! As a special offer, purchase a 10 week pass before Wednesday and you can attend all remaining Wednesday night classes for the year. Or, for any current or past students that would prefer to repeat any part of the Beginner’s course (Monday nights at Wayville) I can offer you $15 discount off any of the Beginner's class pass. Please email me for the discount codes. All courses and classes are available to book https://flexyogaandmassage.corsizio.com/ (I’m trying a new booking system) – please register online even if you prefer to pay cash, EFT transfer or credit card on the night so I can confirm your place. If you can't make a Monday class, you can make it up by attending a Wednesday class and vice versa. Special tennis ball massage workshop coming up! I've spent the last 2 weeks undertaking some serious yoga study. Firstly, a 2.5 day workshop with Simon Borg-Olivier from Sydney, a physiotherapist and well known yoga practioner and anatomy teacher. 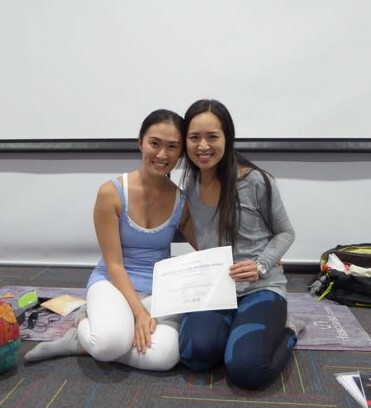 Last week I took the opportunity to study with Jo Phee (Singapore) and graduated from her 50 hour Yin yoga teacher training a few days ago. Both teachers were teaching completely different methods and styles of yoga however the message was the same - modern "alignment" style yoga can potentially cause pain and injury to students that just aren't suited to force their bodies into shapes that are aesthetically pleasing. 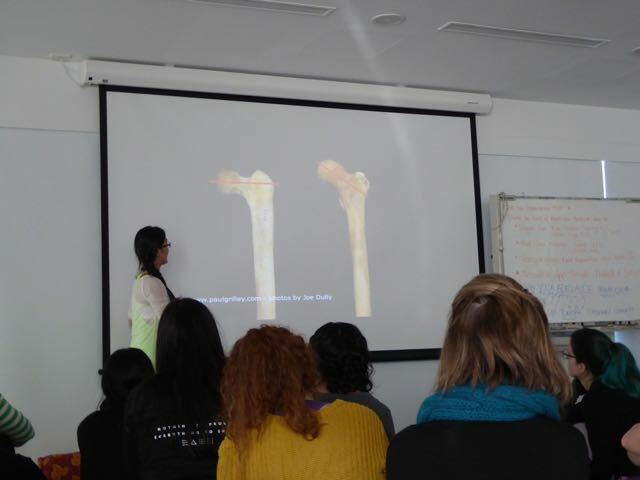 Yoga postures are not one-size fits all and Jo Phee in particular highlighted the variations in our bone structures with lots of anatomy pictures and using our own group of 36 keen students for the bone tests (read on for more). Make sure you do speak up if you are ever concerned about any postures. So the massage part.. How can you acheive a full body massage for just $3? Using a tennis ball! I'm running 2 massage workshops on Wednesday 7th and 14th of September using a combination of thai massage techniques, tennis ball myofascial release and yin yoga postures combining long holds and pressure point release. Current students of my classes are used to seeing the tennis balls pop up in class, but a full 1.25 hours of tennis ball and other massage techniques will be a certainly be a unique experience. 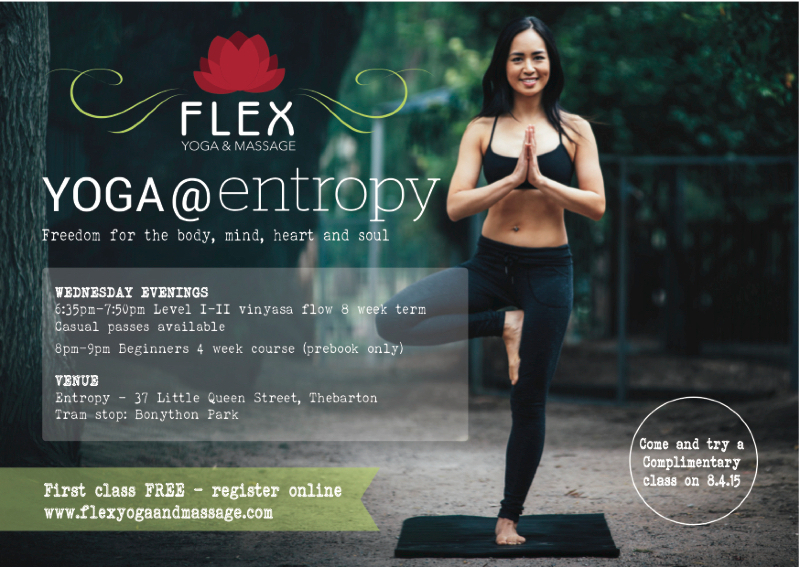 This workshop is ideal for anyone that suffers from muscle aches and pains - whether you are an athlete, weekend warrior, yogi or just sit at a desk all day! No experience in these techniques is necessary. We'll be covering the whole body with variations covered over each workshop. You can book in online to reserve your space, only 10 places available for the general public for each class ($25/each, $40 for both or if you book with a friend). Current students can use their class passes for this workshop - let your non-yoga friends know if you think they might get something out of this. Check out theFacebook event for updates. Paul Grilley's anatomy pictures depicting natural variation in the neck of femur - some people are built to do motions like the splits or putting their legs behind their head, and some just aren't. 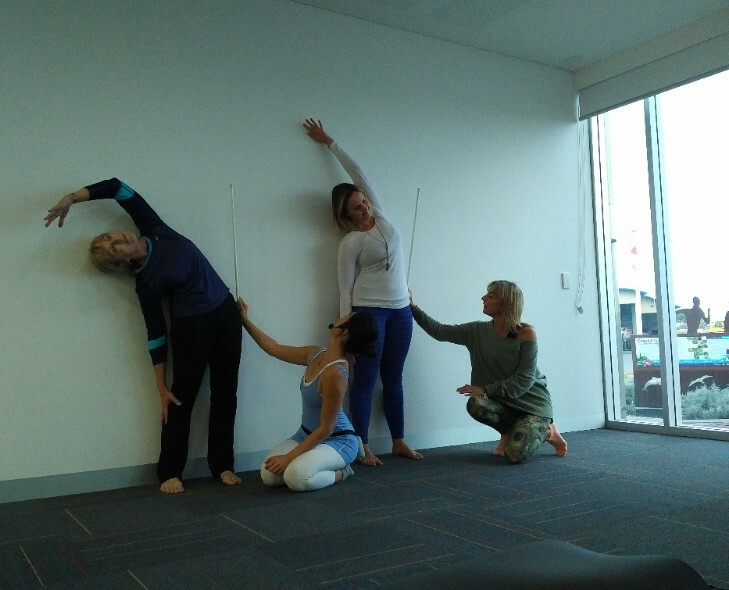 We had fun looking at natural body variation of range of motion around the room of 36 yoga teachers - due purely to bone shape. The "Yinspirational" Jo Phee demonstrating massage techniques combined with yoga postures. The next 2 Wednesday night yoga classes (24/31st August) focus on the spine in an ashtanga yoga sequence. The following 2 Wednesday nights in September (Spring - yay!!) are the massage workshops. Following this I'll be away studying yoga with Flo Fenton for 2 weeks in Brisbane and classes recommence on Wednesday October 5th. 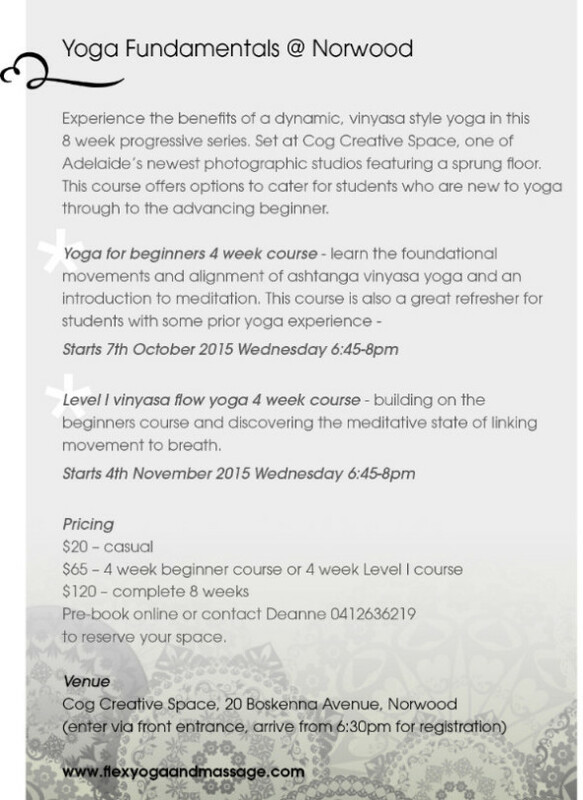 The next beginner's course will start on 10th of October in Wayville (Mondays at 7pm), the last course for the year. Happy Lunar New Year! 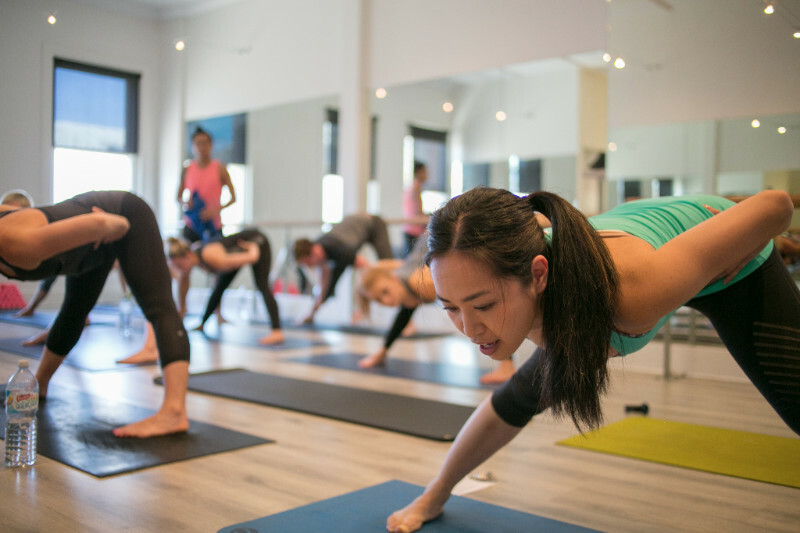 Great news for everyone looking to make some positive changes for their health this year - my next beginner yoga course will be running at a new venue, Chiro Adelaide (266 Glen Osmond Road, Fullarton) in their purpose built pilates studio. 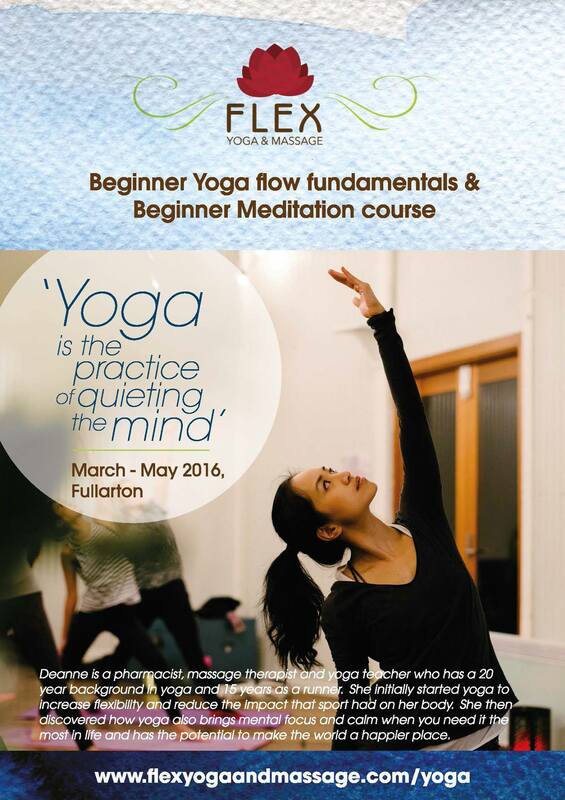 I only run 1 or 2 beginners courses each year, so don't miss out if you've been thinking about trying yoga. Several of my past beginner's course attendees are repeating it this year as they enjoyed it so much! The moves are simple, we build a sequence slowly over several weeks only adding 1-2 posture each week, but you will find yourself working up a small sweat as we learn to flow through the postures together. You don't have to be able to touch your toes to come to class - this course is especially for my first timer friends that tell me "I'm not flexible enough to do yoga"! The beginners course runs on Tuesday nights for 4 weeks during March and then switches over to Wednesday nights for the second block of 6 weeks during April. I'm giving everyone a short 15-20 minute yoga routine to practice as "homework" in between classes to keep up the good work if you so desire. 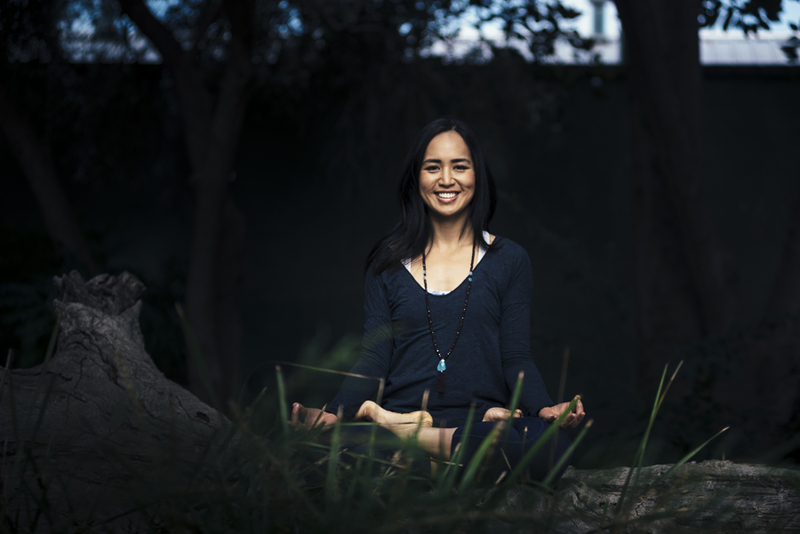 Meditation classes also start during April in a 6 week course format. The techniques are non-religious and I want you to be comfortable (sitting on the floor/chair or lying) so you really relax and learn ways to quieten/let go of thoughts and attachment to thoughts. I'll offer different meditation techniques each week so you can try for yourself and discover what works best for you. Techniques last from quick "spot" meditations up to 15-20minutes by the end of the course. 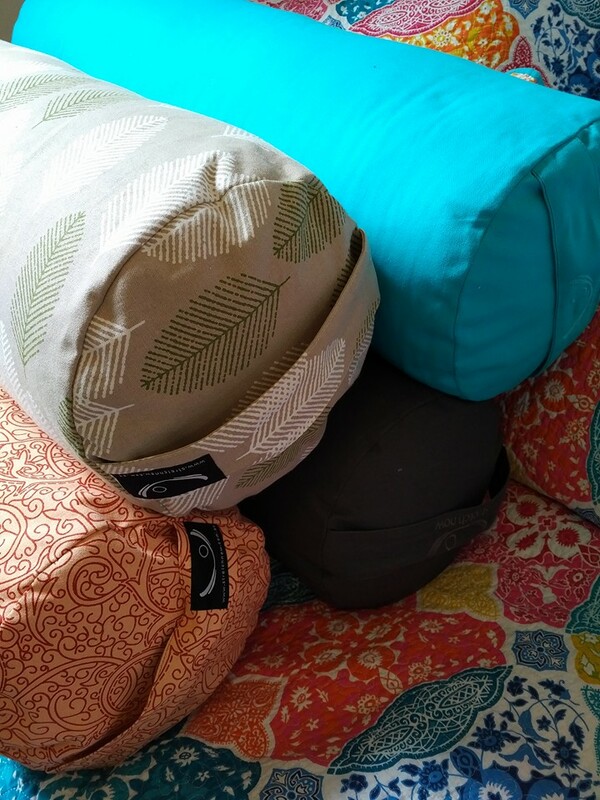 Wondering what you need to bring to class or not sure if yoga is right for you? I have a FAQ page that will hopefully answer some of these questions, or send me a message. Course pricing can be found via my webpage or book in online directly (payment by credit card, direct debit or cash on the day). Please register online no matter what your preferred payment method is as there is limited space at the venue and places are selling fast. You can drop in on a casual basis too, however you'll get the most benefit if you make a weekly commitment. I am offering a further $5 discount if you bring a friend, valid concession card holders and for my past students repeating the beginners course again - message me for the discount code. Also, check-in to the Facebook event page! 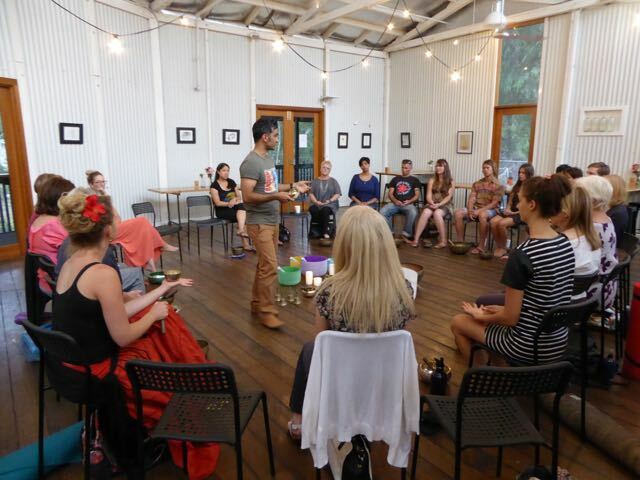 Anup (Singbowl) is back in Adelaide for the Fringe Garden of Unearthly Delights and Womadelaide. 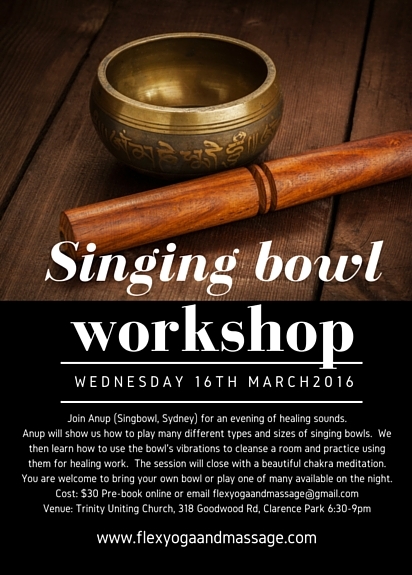 I'm hosting him for the second time to run a Singing Bowl Workshop, Wednesday March 16th 2016. We have a special treat with a special performance pairing singing bowls to the tunes of the church organ! The venue is Church of the Trinity, 318 Goodwood Road, Clarence Park. Bring your own singing bowls from home or learn to play the different types available on the night. 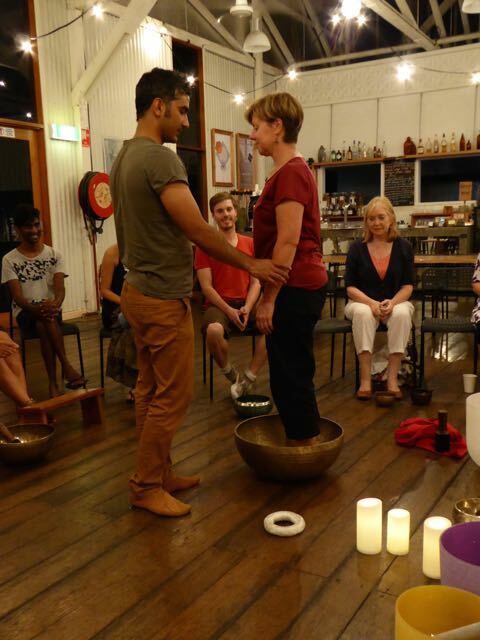 We will learn the correct techniques to play different types of bowls, how to use the bowls for chakra healing and join together for a group meditation. Please see the Facebook event page or buy your tickets online. 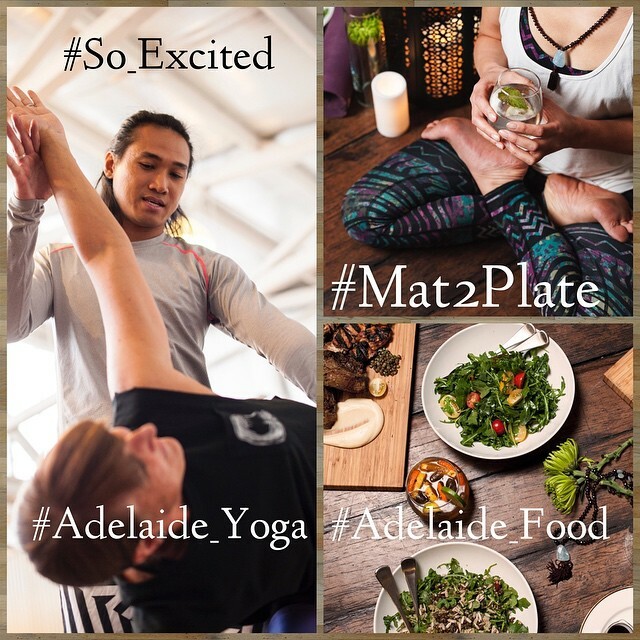 In other news, Russell and myself are bringing back our Mat2Plate singles yoga event in March following our sold out November event (have a look at this short timelapse video of the night). Are you single or know a friend that needs to know? Check out our Facebook for latest info or join our mailing list. 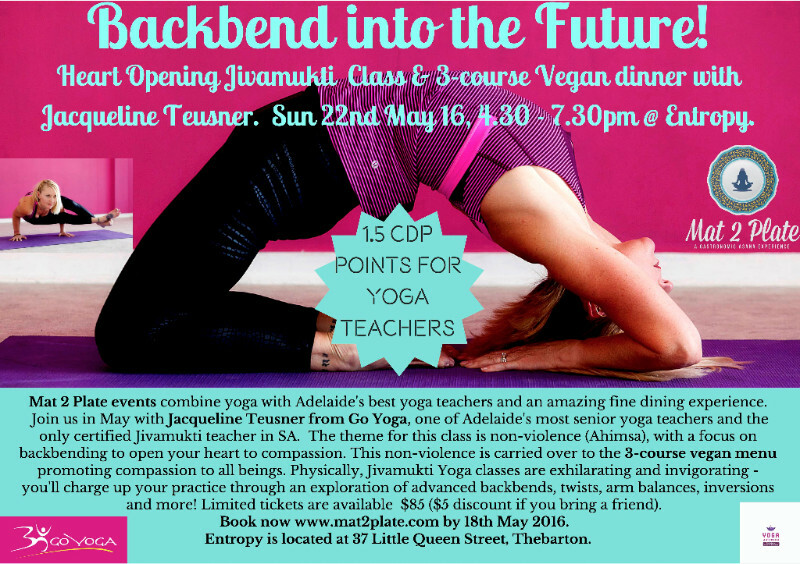 Karen Gunter from YOGA GARAGE will be our guest teacher again with her amazing partner yoga classes. We've been working hard behind the scenes with Mat2Plate and have also been running corporate events. If you are looking for an event with a difference (hen's night, christmas function, work get together), let us know. 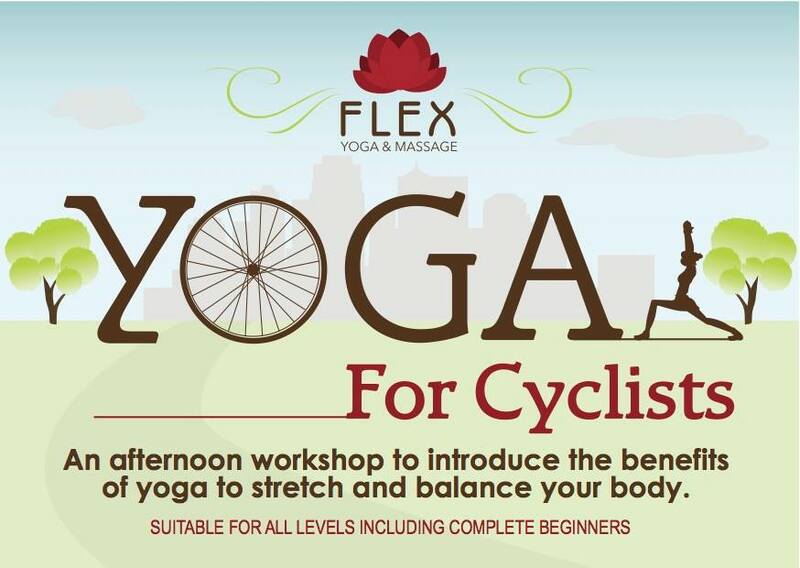 Yoga for Cyclists and Mat 2 Plate information! 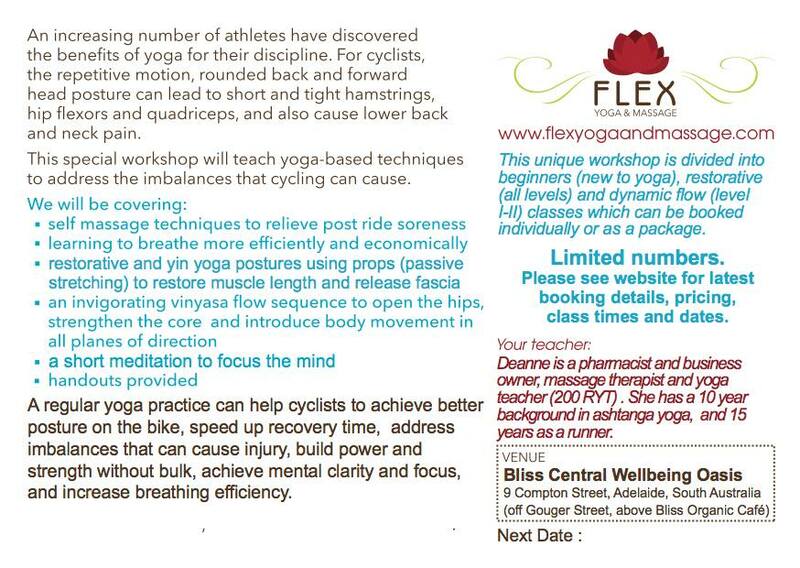 Yoga for Cyclists - Next workshop is really soon! May 17th (Sunday). The workshop will consist of three 1 hour classes that can be booked individually or together. I am including a 1 hour class for "new to yoga" students before the restorative/yin yoga class commences - non intimidating and we'll be breaking down the basic movement patterns of sun salutations and doing some lovely chair yoga stretches. 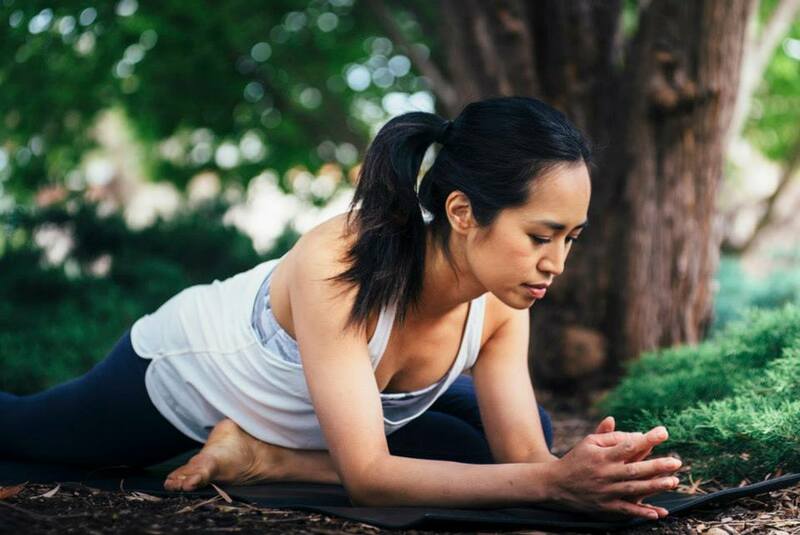 The Yin Yoga/restorative class will be amazing with long holds/stretches (up to 5 minutes) that will bring you into your body in a completely new way. The third class will be a vinyasa flow class with cyclists in mind - something similar to the Lululemon Yoga for Cyclists 4 week course I taught in February. There were over 60 students at each class - thank you so much for your support and energy! This may be the last Cyclists workshop for 2015 so please make sure you book in and show your support if you are interested. See www.mat2plate.com or our Facebook page for more information. I've been teaching yoga here on Wednesday nights - the 8 week course (6:35pm) is still going for a few more weeks with a beginner's class (8pm) straight after. First class is free, please email me for more information if you would like to join (or see my website). 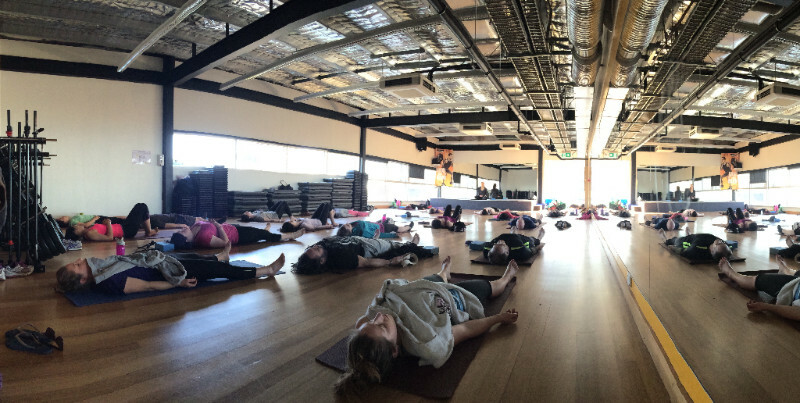 I hosted Yin Yoga master teacher Jennifer Crescenzo (Melbourne) last weekend for a series of Yin Yoga workshops and a teacher training course last weekend. There were 35 students in total that came to practice with Jennifer over the weekend, some travelling from overseas and interstate. I've already started incorporating some of these yin postures into my classes - there is a beautiful meditative and creative aspect to these long, deep holds. My cyclist friends will really appreciate the long holds and stretches of this Yin style of practice. If you have been enjoying the Adelaide Fringe and the Garden of Unearthly Delights, you may have met Anup from Sydney at his Singing bowl stand. He is there to help you to learn to play the bowls and choose what pitch would suit your needs best. 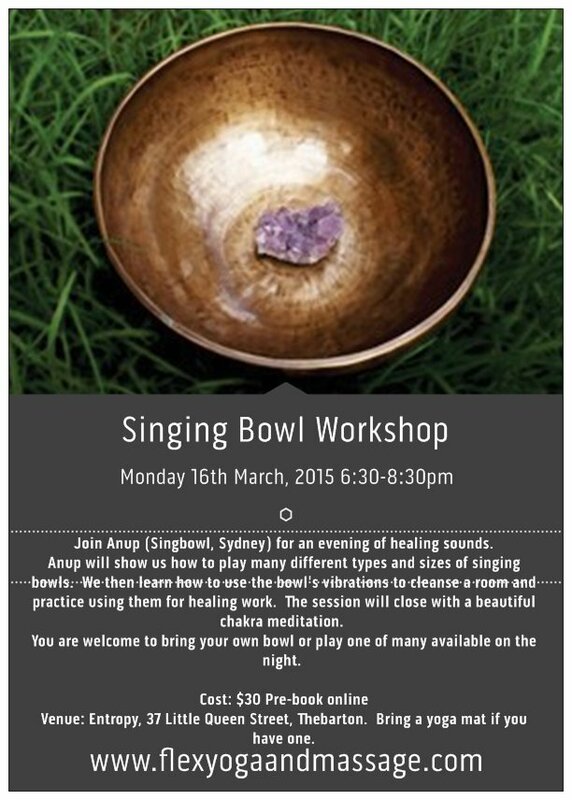 If you would like to learn more about singing bowls and their different uses, come and join him for this workshop on Monday the 16th of March. Duration will be 2-3 hours and will close with a beautiful sound meditation. 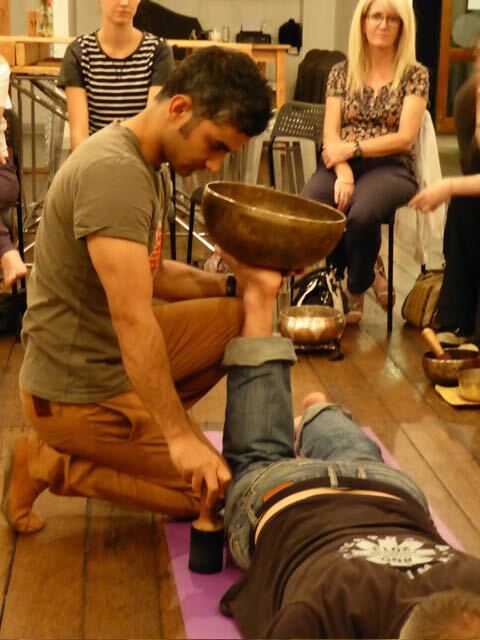 Bring your own bowl from home if you have one - Anup will let you know what pitch it is (and what chakra or other purpose it relates to) and teach you how to play it well if you haven't got the hang of it! Bowls are also available for playing and purchase on the night and the workshop is an ideal opportunity to work with different bowls and sounds to find the one that resonates with you best. Pre booking is preferred but you are also welcome to come on the night. Link to book is via my website. Entropy restaurant is set in a relocated old railway shed - think corrugated iron and beautiful wooden floor boards. Everything served is from local South Australian produce (no Coca-Cola here!) with daily menu specials. I'm teaching an 8 week yoga course in this beautiful space. The launch class (8/4/15) is free and open to everyone - please drop me a line if you are coming! Address: Entropy - 37 Little Queen Street, Thebarton (access from the end of Queen Street), near the Entertainment Centre. Tram stop Bonython Park. Please prepay by booking online or cash only on the night. Stand Up Paddleboard yoga - Indoors at Marion Aquatic Centre! This will be lots of fun and not weather and wind dependant. I'll be teaching some of the Tuesday night classes - stay tuned to my Facebook page for more information. I hope this will give you some inspiration after Mad March has finished and the days become shorter. I hope to see you on the mat (or board) soon!